New research from the University of Southampton has identified how changes in the cell membrane play a pivotal role in how the Hepatitis C virus replicates. By understanding this process, the researchers hope to investigate how to prevent the changes and potentially develop therapeutic drugs to combat the Hepatitis C virus (HCV), which infects an estimated 170 million people globally. When HCV infects a cell it uses one of its proteins, NS4B, to form a lipid-rich structure called the ‘membranous web’. This structure contains ‘reaction centres’, where the virus can replicate protected from the host cell’s antivirus defences. Within NS4B, the AH2 peptide plays a crucial role in remodelling lipid membranes to form the membranous web. However, it is not understood how AH2 causes these changes. Using nuclear magnetic resonance (NMR) spectroscopy in conjunction with molecular dynamics (MD), Southampton researchers showed that AH2 interacts with negatively charged lipid membranes within the cell. It causes them to become more malleable, a property almost certainly important in reaction centre formation. 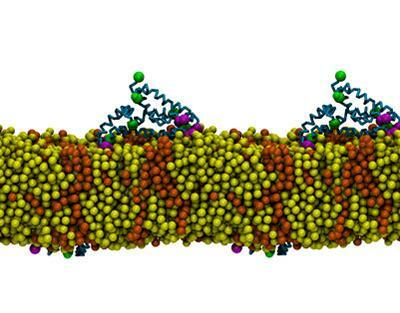 When introduced into membranes with non-charged lipids, AH2 behaved differently, forming larger complexes resulting in limited deformation of the membrane, consistent with a separate role in early steps of membranous web formation. The research, which was produced by undergraduate students from the University’s Centre for Biological Sciences as part of an interdisciplinary team of researchers from Biological Sciences, Chemistry and Medicine, is published in BBA Biomembranes.